The Fort Wayne Komets are a minor league ice hockey team in the ECHL. They play their home games at the Allen County War Memorial Coliseum in Fort Wayne, Indiana. This team was previously a member of the Central Hockey League, the original International Hockey League, and the second International Hockey League. They have won four post-season championship titles in the original IHL in 1963, 1965, 1973 and 1993, four in the UHL/second IHL in 2003, 2008, 2009 and 2010, and one in the CHL in 2012. In all of North American professional hockey, only the Original Six teams of the NHL and the Hershey Bears of the AHL have played continuously in the same city with the same name longer than the Komets. The ECHL is a mid-level professional ice hockey league based in Princeton, New Jersey, with teams scattered across the United States and two franchises in Canada. It is a tier below the American Hockey League. Allen County War Memorial Coliseum is a 13,000-seat multi-purpose arena located in Fort Wayne, Indiana, near present-day Johnny Appleseed Park. It opened in 1952 with a construction cost of nearly $3 million. The Allen County War Memorial Coliseum was originally designed to seat 8,103 for hockey or 10,240 for basketball. Opened in 1989, the Coliseum's $26 million Exposition Center contains 108,000-ft² (0.100-km²) devoted to hosting substantial trade shows and other events with seating for 7,500. The Albany Choppers was an independent professional ice hockey team in Albany, New York competing in the International Hockey League during the 1990–1991 season. In 1999, the second IHL Komets franchise joined the United Hockey League (which later took the IHL name in 2007). In 2010, the UHL/IHL ceased operations and the Komets joined the Central Hockey League along with the surviving members of their former league. They left the CHL for the ECHL in 2012. The United Hockey League (UHL), originally known as the Colonial Hockey League from 1991 to 1997 and last known as the International Hockey League from 2007 to 2010, was a low-level minor professional ice hockey league, with teams in the United States and Canada. 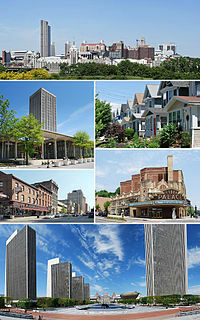 The league was headquartered in Rochester, Michigan, and, in its last year, consisted of seven teams. It folded in 2010, with most of its teams joining the Central Hockey League. The Central Hockey League teams still operating in 2014 were then added to ECHL. The only former CoHL/UHL/IHL teams still active as of 2018 are the Fort Wayne Komets and Kalamazoo Wings. The 2014–15 ECHL season was the 27th season of the ECHL. The regular season schedule ran from October 17, 2014, to April 11, 2015, with the Kelly Cup playoffs following. Twenty-eight teams in 20 states and one Canadian province each played a 72-game schedule. The league was significantly expanded just before the season in October 2014 after a merger with its longtime rival, the Central Hockey League. The Colorado Avalanche, known colloquially as the Avs, are a professional ice hockey team based in Denver, Colorado. They are members of the Central Division of the Western Conference of the National Hockey League (NHL). The Avalanche are the only team in their division not based in the Central Time Zone; the team is situated in the Mountain Time Zone. Their home arena is Pepsi Center. Their general manager is Joe Sakic. The Chicago Wolves are a professional ice hockey team playing in the Central Division of the Western Conference of the American Hockey League. The Wolves play home games at the Allstate Arena in the Chicago suburb of Rosemont, Illinois and are owned by Chicago business owners Don Levin and Buddy Meyers. They are the minor league affiliate of the Vegas Golden Knights. These are the top-ten point-scorers in franchise history. Figures are updated after each completed regular season. On March 28, 2008, the Komets set a new professional hockey record of 23 straight home wins. They defeated the Kalamazoo Wings 4–3. The record ended at 25. On May 15, 2010, the Komets defeated the Flint Generals in Game Five of the IHL Turner Cup Finals to win the series, 4 games to 1, earning the Komets a "three-peat" after winning the Turner Cup in 2008 and 2009 as well. The San Antonio Rampage are an ice hockey team in the American Hockey League based in San Antonio, Texas. They are currently the top affiliate of the St. Louis Blues of the National Hockey League (NHL). The Rampage are owned by the San Antonio Spurs of the NBA, who purchased a dormant AHL franchise with the NHL's Florida Panthers and moved it to San Antonio. The Rampage play in the AT&T Center in San Antonio, the same arena as the Spurs. The Springfield Falcons were an ice hockey team in the American Hockey League (AHL) and played in Springfield, Massachusetts, at the MassMutual Center. The Tulsa Oilers are a professional ice hockey team based in Tulsa, Oklahoma, which play in the ECHL. The Oilers played their home games at the Tulsa Convention Center until 2008 when they moved into the new BOK Center. For many years, the Tulsa Oilers name was shared with Tulsa's former minor-league baseball team that pre-dated the Tulsa Drillers. To reduce confusion in local news reporting, the hockey team was often called the "Ice Oilers". The Colorado Eagles are a professional minor league ice hockey team based in Loveland, Colorado. The Eagles play in the Pacific Division of the American Hockey League's Western Conference. The Capital District Islanders were a team in the American Hockey League based in Troy, New York, which is located within a region popularly called the Capital District. The Islanders were the principal minor league affiliate of the National Hockey League's New York Islanders during the 1990–91, 1991–92 and 1992–93 seasons. The Allen Americans are an ice hockey team headquartered at the Allen Event Center in Allen, Texas, which currently plays in the ECHL. The team was founded in 2009 in the Central Hockey League (CHL) where they played for five seasons, winning the Ray Miron President's Cup twice. The CHL folded in 2014 and the ECHL accepted the remaining CHL teams as members for the 2014–15 season. In their first two seasons in the ECHL, Allen advanced to the Kelly Cup finals, winning the championship in both years. Jared Bednar is a Canadian professional ice hockey coach and former player. He is the current head coach of the Colorado Avalanche of the National Hockey League (NHL). Justin Hodgman is a Canadian professional ice hockey player who currently plays for the Fort Wayne Komets of the ECHL. Nick Boucher is a Canadian former professional ice hockey goaltender who played for the Fort Wayne Komets of the CHL. Guy Dupuis is a Canadian retired professional ice hockey defenseman. He is known for playing fourteen seasons with the Fort Wayne Komets of the CHL. Dupuis was the last active member of the Komets' 1993 Turner Cup-winning team. Roman Will is a Czech professional ice hockey goaltender currently playing with HC Bílí Tygři Liberec of the Czech Extraliga (ELH). He has formerly appeared in the National Hockey League (NHL) with the Colorado Avalanche. The Iowa Wild are an ice hockey team in the American Hockey League, that began play from the 2013–14 season. The team plays at Wells Fargo Arena in Des Moines, Iowa, as the AHL affiliate of the NHL's Minnesota Wild. The 2015–16 ECHL season was the 28th season of the ECHL. The regular season schedule ran from October 16, 2015 to April 9, 2016 with the Kelly Cup playoffs to follow. Twenty-eight teams in 21 states and one Canadian province will each play a 72-game schedule. The league alignment was significantly altered before the season when the American Hockey League announced the formation of a Pacific Division on January 30, 2015 displacing the ECHL teams that had been in California markets. Mitchell Heard is a Canadian professional ice hockey center currently under contract with the Straubing Tigers of the Deutsche Eishockey Liga (DEL). Heard was drafted 41st overall in the 2012 NHL Entry Draft by the Colorado Avalanche. The 2018–19 ECHL season is the 31st season of the ECHL. The regular season is scheduled to run from October 12, 2018, to April 7, 2019, with the Kelly Cup playoffs to follow. Twenty-seven teams in 20 states and two Canadian provinces each play a 72-game schedule. ↑ "Komets announce affiliation with NHL's Avalanche and AHL's Monsters". WANE-TV . 2014-07-24. Archived from the original on 2015-07-29. Retrieved 2014-07-24. ↑ "Colorado affiliation could be different and better for Komets". News-Sentinel . 2014-07-24. Archived from the original on 2014-07-29. Retrieved 2014-07-24. ↑ "Komets put together two-year deal with Avalanche". News-Sentinel . 2015-07-21. Archived from the original on 2015-07-23. Retrieved 2015-07-22. ↑ "Komets, Avalanche Terminate Affiliation". OurSports Central. July 19, 2016. ↑ "Coyotes Announce ECHL Affiliation With Fort Wayne Komets". tucsonroadrunners.com. July 31, 2017. Retrieved August 1, 2017. ↑ "Fort Wayne Komets, Arizona Coyotes and Tucson Roadrunners end affiliation". The News-Sentinel . June 18, 2018. ↑ "Komets announce affiliation with NHL's Vegas Golden Knights". Komets.com. 2018-08-21. Archived from the original on 2018-08-21. Retrieved 2018-08-21. ↑ "Fort Wayne Komets Standings". hockeydb.com. 2013-03-04. Retrieved 2013-03-04. ↑ "Komets Hall of Fame". Fort Wayne Komets. 2015-08-15. Retrieved 2015-08-15. ↑ "Sims thrilled about Komets saluting 504". The Journal Gazette . March 24, 2017. ↑ "Fort Wayne Komets Elite Prospects". EliteProspects.com. Retrieved February 11, 2019. Wikimedia Commons has media related to Fort Wayne Komets .